In light of the recent turmoil in Japan, it can be difficult to sort through all the noise and understand the best ways to help out. The Volunteer and Service Center at CSU Fullerton has compiled a list of resources, which you can download here. Living Social: Donate $5 to Red Cross through Living Social and they will match your donation. Volunteers who are skilled in disaster relief and are familiar with Japanese language and culture will be needed. Well-intentioned individuals without vital disaster relief skills and Japanese fluency should contribute in other ways, such as donation. CIDI.org is a good start for learning how you can contribute as a volunteer. PAPER WORDS is a short 3D-animated film about a bright, five year old girl from China who uses her imagination to cope with her new life in America. Its content in the unusual form of animation makes this a unique, entertaining while being educational program for broad audiences as well as Asian Americans and immigrants. PAPER WORDS is having its national broadcast on Saturday, Feb. 26, 2011. 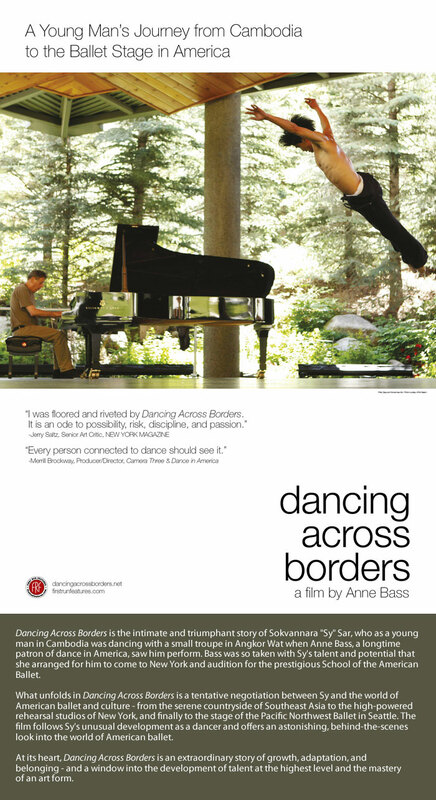 It will be playing in 26 states and about 50 cities. Boston, Milwaukee, New York, Phoenix, Spokane, Tucson, Philadelphia, Burlington VT, Knoxville TN, Dallas-Fort Worth, Cleveland OH, Syracuse, Santa Fe, Rochester, Vermont, NYC, and plenty of places in Idaho, Little Rock AR, Chico CA, Redding CA, and many other cities. We encourage you on World AIDS Day to learn about the way that AIDS and HIV affect our API communities. Former MANAA Vice President, Leslie Ishii, Makes Triumphant Directorial Debut at East West Players in "Crimes of the Heart"
MANAA is pleased to announce that former MANAA Vice President, Leslie Ishii, has a success on her hands. She is directing "Crimes of the Heart," playing at East West Players from November 4 until December 5. This is Ishii's directorial debut. One of the reviewers calls her direction "spot-on" and the other reviewers asserted that her direction was "with a steady hand." See the links to the reviews, below. Congratulations, Leslie, on a job well done! Our friends at Racebending.com recently alerted us to the fact that in Marvel's casting announcement for a film version of The Runaways, the character of Nico Minoru was not specified as Asian American. We are so happy to report that they have remedied this situation! Thanks to Marissa Lee at Racebending for taking on this important issue. For more info, check out this report. We recently heard that Marvel Entertainment has updated the casting notice for THE RUNAWAYS to specify that Nico Minoru is Asian American and extended the deadline for submissions. On behalf of the Media Action Network for Asian Americans, I wanted to thank you for this quick response to the concerns of the Asian American community. We take this action as an indication that Marvel is dedicated to seeking out minority talent for this project, which I'm sure you know is one of the most important steps toward diversifying our media landscape and providing more balanced representations of minorities. Thank you again for listening to our concerns and taking action to support our community. We look forward to conversations with you in the future. LOS ANGELES- MANAA, the Media Action Network for Asian Americans, is pleased to announce one $1000 scholarship for currently enrolled graduate and undergraduate students interested in pursuing careers as filmmakers and in television production (not broadcast journalism). Formed in 1992, MANAA is the only organization solely dedicated to monitoring the media and advocating balanced, sensitive, and positive depiction and coverage of the Asian American community. MANAA recognizes the urgent need to fill the ranks of television and film with persons of Asian descent in decision-making positions as screenwriters, directors, producers, and studio executives. We are looking to award students who have a strong desire to advance a positive and enlightened understanding of the Asian American experience in the mainstream media. Scholarship recipients will be selected on the basis of their academic and personal merit, desire to uplift the image of Asian Americans in film and television as demonstrated in their essay, and potential as demonstrated in their work sample. 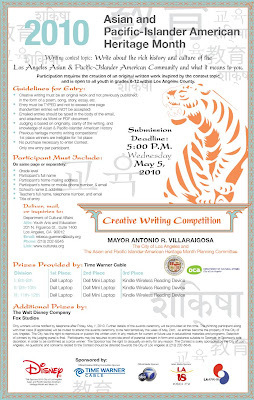 The postmark deadline for submission is Friday, October 29, 2010. STUDENTS MUST SUBMIT THE FOLLOWING MATERIALS. INCOMPLETE APPLICATIONS WILL NOT BE ACCEPTED. 1. A copy of all official transcripts. 2. Two letters of recommendation, one that evaluates academic and artistic aptitude and another that speaks to the student’s interest and involvement in the community. 3. A double-spaced essay consisting of no more than 1,000 words addressing the following items: Describe your involvement in the Asian/Pacific Islander Community. How does this involvement influence your creative work? How do you see your creative work influencing the API community in the next five to ten years? 4. A work sample consisting of either a short film or a selection from a screenplay (your best scene plus a synopsis or a 1000-word excerpt). Materials will not be returned. 5. A resume of both your work history and your community involvement. Send all completed applications to MANAA Scholarship, P.O. Box 11105, Burbank, CA 91510. Please do not send applications via certified or registered mail. Any questions regarding the scholarship should be directed to scholarship@manaa.org or (213) 486-4433. Protesting the premiere of "The Last Airbender"
Attention all MANAA and Racebending supporters, Asian American community organizers, and thousands of disgruntled fans of Nickelodeon's Avatar: The Last Airbender! A boycott/protest is being planned for the opening night of the movie, Thursday July 1st. More volunteers are needed to hold the protest in Los Angeles. Please volunteer, make your voice heard, and send a message to the entertainment industry. For more information, see www.manaa.org/lastairbender.html or find MANAA on Facebook. Join OCA-OC and MANAA for an evening with famous Asian American actors discussing their experiences in Hollywood and their efforts to change the way mainstream media portrays Asian Americans. Join API Equality LA for a screening of Saving Face on May 23 1:30pm at Bruggemeyer Library in Monterey Park, 318 S Ramona Ave. 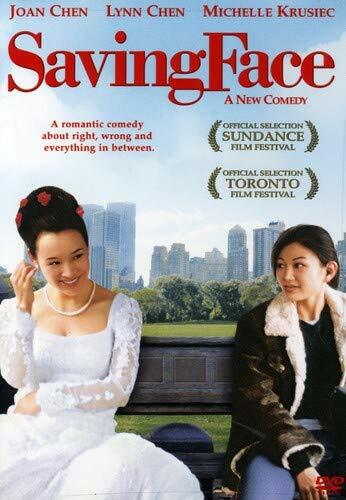 Saving Face (2004, 96 min) is about a Chinese-American lesbian and her traditionalist mother who are reluctant to go public with secret loves that clash against cultural expectations. The panelists will be addressing issues of Asian Pacific Islanders in cinema and gay, lesbian, bisexual and transgendered people in the Asian Pacific Islander community. Free popcorn and kuri manju at the screening and discussion! Saving face can't make you safe. Talk about HIV. We recently heard from The Banyan Project about their new campaign, "Saving face can't make you safe. Talk about HIV." In honor of National Asian and Pacific Islander HIV/AIDS Awareness Day, we wanted to take this opportunity to share their public service announcement and some facts about the threat of HIV/AIDS in Asian American communities. The Media Action Network for Asian Americans would like to respond to Frank Marshall's comments that "Paramount has since been in regular dialogue with Asian American advocacy groups including the Japanese American Citizens League and the Media Action Network for Asian Americans to ensure that such a mistake does not happen in the future.” Although we are pleased to see that Marshall admit that their use of third-party casting agents resulted in casting language that was “poorly worded and offensive,” their dialogue with Asian American advocacy groups on the issue of discriminatory casting in The Last Airbender have been far from productive. MANAA, Asian American advocacy groups, and members of the Asian American community contacted the producers of The Last Airbender in early 2009. In the letters, voicemails, and emails, producers were made aware that the casting language "Caucasian or any other ethnicity" was discriminatory, and that this language had clearly affected the initial cast of lead actors. After over a year of ignoring public concerns over this casting language as well as the production's cultural competency as a whole, it is disingenuous for Frank Marshall to trot out his iteration of the casting language to excuse the production's repeated gaffes. The phrase "Caucasian or any other ethnicity"—language that would be unacceptable for any job posting that was truly open to all races—was used on every major casting website and document, including Paramount's own. The resultant casting reinforces a double standard and glass ceiling where it is acceptable for a white actor to portray any ethnicity, but Asian American actors cannot even portray characters of their own ethnicity. 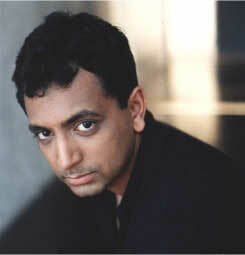 M. Night Shyamalan’s recent dismissive comments to UGO.com that the casting is "more than [fans] could have expected" in terms of diversity are indicative of the production's failure to recognize the true discriminatory impact of their casting decisions. In early 2009, MANAA and other Asian American advocacy groups repeatedly asked for a meeting to discuss the casting and depiction of cultures in the movie. The only response MANAA and other groups received was a letter from the production anonymously signed "The Producers." We have received no indication that "these mistakes will not occur in the future" because the production has never spoken with us. The production was not willing to meet with concerned Asian American advocacy groups, even though they were willing to fly Airbender fans to New York City for a catered breakfast with Shyamalan and lodging at a luxury hotel. The “regular dialogue” Marshall mentions was actually the result of a protest over racial humor, hate crime jokes, and the use of the word "Jap" in another Paramount Pictures film, The Goods: Live Hard, Sell Hard. Due to outrage over this other Paramount production, we have been able to discuss the casting situation of The Last Airbender with the newly-promoted Paramount executives. In November 2009, Paramount promised MANAA diversity statistics and a pre-screening of The Last Airbender to assuage our concerns about the film's diverse depictions. Despite the fact that The Last Airbender has been prescreened to at least two groups, we have been repeatedly rebuffed in our requests to see the version shown to these groups. Although it has been five months since that November meeting, we hope Paramount still plans to live up to its promises. The film Dancing Across Borders, a young man's journey from Cambodia to the ballet stage in America, opens in LA this Friday. Click on this image to enlarge for more info. For those of us waiting for M. Night Shyamalan to address our concerns about the discriminatory casting in The Last Airbender, this latest article on ugo.com reveals some of his thinking on the matter. Unfortunately, it seems he really doesn't understand why everyone's so upset. One good thing is that he admits that he's heard about the protest. But to respond to our calls for people of color as heroes, he simply points to the racial indeterminacy of anime -- as if that justifies the casting of only "European"-featured heroes. He completely neglects to mention that they specifically cast for white actors, instead implying that they were really trying to populate their world with a mix of races. Which would be hard to do with the casting announcement for "Caucasian or any other ethnicity." He also states, "Maybe they didn’t see the faces that they wanted to see but, overall, it is more than they could have expected. We’re in the tent and it looks like the U.N. in there." False. We expected to see people of color as the heroes, rather than as the background actors and the villains, so we are not getting even close to these expectations. Also, if he were true to his metaphor of the U.N., he would have sat people of color at the table next to white people, as equals. Finally, when prodded about how "the only characters of color are baddies," he responds "It's called irony." It's hard to read this remark since it doesn't make any sense, but the most disappointing thing is that he truly doesn't seem to take this critique seriously. Kudos to Jordan Hoffman for getting responses to these "touchy" questions (except for the conspiracy theorist comment...), and a big thumbs down to M. Night Shyamalan for failing to respond appropriately. You're invited to the annual Academy of Television Arts & Sciences Diversity Committee Career Workshop on the evening of April 19th. The event will be at the TV Academy, with check-in from 6:00 - 7:30pm. Event will start at 7:30pm and proceed until 10:00pm. Entry-level people who are aspiring to become Network & Studio Executives, Producers, Agents, Writers, Directors, Production Staff; anyone seeking entry-level positions including PAs, assistants, interns, and those trying to move up the ladder. Come in business attire and bring a pen and notepad in a leather portfolio. Our goal is to get new folks into the system, train them and nurture them toward a successful entertainment career and build more fresh creative voices which ultimately impact society. MANAA finally jumped on the new media/social software bandwagon (hey, it's never too late right? )...join us on Twitter and Facebook! We promise to have exciting updates on everything that we're doing. Join us and get in on the action! This list of the 50 Most Racist Movies in Complex magazine is pretty great. Of course, we disagree with the subtitle "you didn't think were racist," since MANAA's long been busy pointing out the racism in movies like Dragonball, 21, The Last samurai, 16 Candles, and of course number one on the list Breakfast at Tiffany's. But it's always great to see a compilation like this. Reminds us all that racism is indeed systemic in our culture and particularly in the media, surrounding us daily with images that are stereotypical and problematic. Check out the list and then think about how many more movies could be added to the list every year. Staggering, isn't it? Most of all, we just agree with the list's imperative -- "Turn on your racist radars, people!" If you're on Facebook, you might have noticed that your friends have lately been changing their profile picture to "their celebrity doppelganger." Something you might NOT have noticed is that people of color haven't really been playing along. Why not? Maybe because when they try to think of celebrities who look like them, the list is just too small. 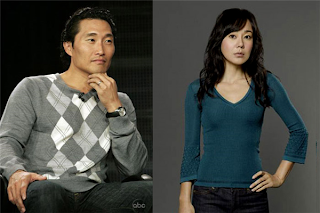 While most white people can think of a celebrity who shares their hair color and length, the shape of their eyes, their smile, it's much less likely that all of your Asian friends happen to look like Lucy Liu, Sandra Oh, or John Cho. What are the odds, really? Yet another moment when we realize that something is missing from our media landscape -- the faces of people who look like us and our friends. As it is, most Asian people have probably been told that they DO look like Lucy Liu or Sandra Oh, even if they look nothing like them (all look same right? wrong!). This Facebook meme offers a perfect opportunity to really think about what kind of people populate the media and what kind of people are missing. What would it feel like if you never saw anyone who looked like you, sounded like you, shared your experiences and histories in the media? If you never felt like one day you could be a famous celebrity? 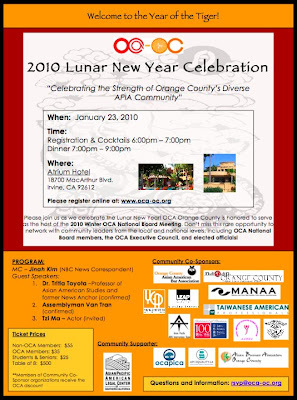 MANAA is proud to be a Community Co-Sponsor of OCA-OC's 2010 Lunar New Year's Celebration this Saturday, Jan. 23rd at 6pm at the Atrium Hotel in Irvine, CA. 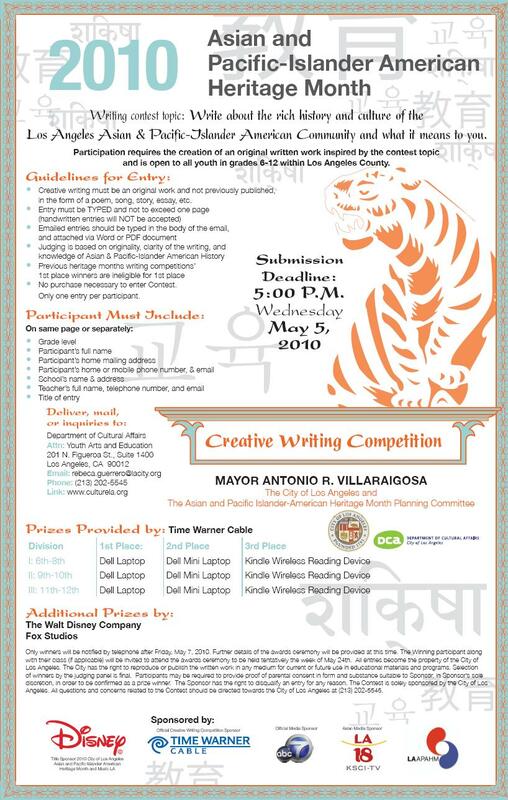 Join MANAA and the Organization of Chinese American's Orange County chapter ring in the Year of the Tiger! MANAA is an all-volunteer, non-profit organization dedicated to monitoring the media and advocating balanced, sensitive, and positive coverage and portrayals of Asian Americans. Formed in 1992 by Guy Aoki, it has pushed the television and motion picture industries to include more Asian Americans in their projects and educated Hollywood about the stereotypes that have often plagued the APA community.